Here's my new PERSONAL USE ONLY tagger size kit, inspired by the holiday next month and especially the friday that comes after it: Black Friday. 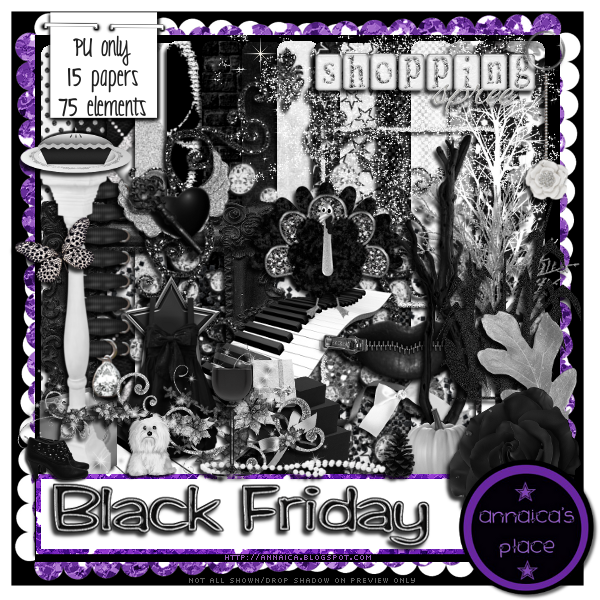 I haven't ever particularly been fond of shopping on that day, but I am part of a very small percentage LOL... Black Friday has 15 patterned/textured papers and 75 elements including 4 frames, 2 wordarts, 8 bows/ribbons, 16 flowers/trees/foliage, lots of diamonds, shopping bags and boxes, jewelry, hearts, lips, 2 turkeys, a dog, a butterfly and even a little snow (for us midwesterners, snow is normal in November). There's just alot, it's bound to suit all your tagging needs! You can purchase this kit at the stores I sell at! oh i love this idea i hate Black friday after having to work one of them I never go near a mall or store on that day.. Ever.. Thank you so much, love it.